Heavy wall structural tube frame, ends capped, continuously welded, with Steel-It ® epoxy finish. System designed for a Class I, Division II, Group D environment. Corrosion-resistant stainless steel loading deck. 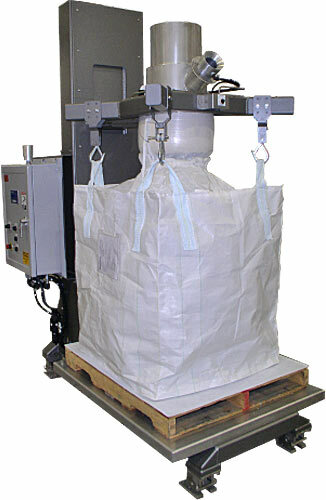 Sensor interlock ensures bulk bag is present prior to start of fill cycle. Power-Lift™ powered fill head height adjustment system. Inflatable USDA/FDA approved spout seal creates a dust-tight connection between the filler inlet tube and bulk bag fill spout. 316-2b stainless steel material contact surfaces with continuous TIG welds ground and polished smooth. Wash down duty gain-in-weight scale system features Mettler-Toledo digital weight indicator with analog output module and stainless steel weigh modules. Pressurized corrosion-resistant NEMA 4X control enclosure. Fill head features a 3” diameter dust take-off stub.